In November of this year our entire people will celebrate the 40th anniversary of the founding of the Party and the 37th anniversary of the triumph of the people’s revolution. From the height of 49 years, which separate us from the day when the Party was founded, we see even more clearly and with revolutionary optimism the giant historic strides we have taken. By means of the national liberation war – the greatest war for national and social emancipation in their age-long history, the Albanian people, under the leadership of the Communist Party of Albania (today the PLA), with comrade Enver Hoxha at the head, got rid of the foreign Nazi-fascist invaders, overthrew the exploiting classes and the local traitors and, on November. 29, 1944, set up the new state of people’s democracy as a form of the dictatorship of the proletariat, on the ruins of the old anti-popular state machine. For the country to embark on the road of socialist construction, the people’s power made major transformations of a political, ideological, economic and social character which were carried out under the leadership of the Party. The transformations in the field of the economy occupy a principal place in this context. Our Party, led by the teachings of Marxism-Leninism and implementing them in the concrete conditions of the country, worked out a development program for the socialist economy and for the development all the other sectors, with the aim of setting up and developing an independent, self-sufficient socialist economy. In the process of socialist construction this program has been perfected step by step and has found its concretization in six five-year plans of economic and cultural development. In the struggle for the building of this economy the PLA has proceeded from the Marxist-Leninist thesis that the relations of production are those which distinguish one socio-economic order from another. Therefore, the first and foremost task carried out by the Albanian state of the dictatorship of the proletariat for the creation of a socialist economy was the destruction of the feudal and capitalist base of the economy, the construction of the socialist base of the economy, and the establishment of the socialist relations of production. With this are connected a whole series of deep-going revolutionary measures, which began to be adopted in the early days after Liberation, with the aim of putting ownership and all the relations of production on a socialist basis, and of building the economic base of socialism, which is constantly perfected in a revolutionary way. Along with the struggle and efforts for the establishment and strengthening of the economic base of socialism and parallel with it, the PLA has also worked for the construction of the material-technical base of socialism. To achieve this it has always proceeded from the teachings of Marxism-Leninism that all socio-economic order rest on its own material-technical base. Therefore, our socialist order, which began to be built after Liberation, objectively and necessarily called for a material-technical base of its own. The creation and development of the material-technical base presupposes a degree of socialist industrialization of the country, without which neither the successful construction of socialism, nor the guarantee and strengthening of the political and economic independence of the country can be conceived. “The transition of our country from a state of semi-feudal technical-economic backwardness directly to the construction of socialism, skipping over the stage of developed industrial capitalism,” says Comrade Enver Hoxha, “laid down before the Party the vital and most urgent task of the creation of industry through the socialist industrialization and electrification of the country” (Enver Hoxha, Report to the 4th Congress of the PLA, p. 36, Alb. ed.). The 37-year long experience of socialist construction in Albania fully corroborates this Marxist-Leninist truth. When they embark on the socialist road, the undeveloped countries (as was the case of Albania) must simultaneously solve two problems, inseparably linked, namely, they must overcome the backwardness inherited from the past and build socialism. These two problems cannot be solved without developing the industry. That is why the PLA has always considered the industrialisation of the country one of the most important tasks of the construction of socialism, without the solution of which the socialist revolution cannot be promoted on the economic front. Raising with force the urgent need for the implementation of the course of the socialist industrialisation of the country, the PLA proceeded from the tasks of overcoming within the shortest time possible the great technical-economic backwardness, of raising the level of development of the productive forces, of deepening the technical-scientific revolution, of building the material-technical base of socialism, of ensuring the growth and strengthening of the working class – the basis of the people’s power, of building a complex industry capable of processing the local raw materials with high effectiveness. The industrialization of the country would help carry out, as it did, many other tasks of major political, economic and social importance. These tasks comprised the socialist collectivization of agriculture and, in general, the building of the economic base of socialism, that is, the triumph of the new, socialist relations of production, the raising of the productivity of social work through the uninterrupted technical progress of the people’s economy, the expansion of production of broad consumer goods, and as a result, the uninterrupted improvement of the material well-being and raising of the cultural level of the broad working masses, the strengthening of the economic independence and defence potential of the country. In spite of the inner difficulties of development, in spite of all hindrances created by the internal and external enemy, in spite of the pressure and savage blockade of the imperialists and revisionists of all shades – Soviet, Yugoslav, Chinese, the course of the Party for the socialist development of the country, substantiated in the five-year plans, today, after about four decades of existence of the people’s power, has given brilliant results. Albania was transformed from a backward agricultural country into an agricultural-industrial country and has long since embarked and is marching with determination on the road of becoming an industrial-agricultural country, which is an historical trend. A completely new and complex, heavy and light industry has been set up in Albania, which produces above five times as much as in 1960. The production of 1938 is realized in less than 3 days today. A great quantitative and qualitative step forward bas been made, going in general from unimportant artisan manufacturing to large-scale industrial production realized in many new branches, such as the industry of iron-nickel processing, chemical, electric power, engineering and construction materials industries, as well as several branches of the food-processing and light industry. Our socialist industry is in a position to lead the extended socialist reproduction, to constantly improve the material well-being and to raise the cultural level of the working masses, to increase and strengthen the defence potential and the technical-economic independence of the country. In the course of the industrial development of the country, the PLA has always been guided by the Marxist-Leninist principle of giving pride of place to the development of heavy industry as against the light industry, with the key branches of heavy industry occupying first place. Relying on the internal resources, particular importance has been attached to the oil sector, both for the discovery and the extraction of oil, to the mining, mechanical engineering, power, and chemical industry, to the ferrous and non-ferrous metallurgy, etc. The development of our heavy industry is made in two directions: in the mineral extracting industry and in the processing industry, to ensure that our country meets its needs with the most necessary products, and not only exports raw materials but also increases the export of finished goods. Particular importance has been attached to the setting up of the power basis. The development of the oil, gas, coal, electric power and other branches has always been seen as a question of particular political and economic importance for the development of the economy as a whole, for the strengthening of the independence of the country and the raising of its defence potential. Relying on the existing power basis and on its perspective development during this five-year plan, our country will be in a position to meet all its needs with electric power and export part of it. The high rates of the development of the main branches of industry are illustrated with the following comparative figures: in 1980 the production of electric power increased 14 fold, the extraction of coal 4.5 fold, of chrome 4 fold, of copper 25 fold, the production of the chemical industry 50 fold, of the engineering industry 21 fold, etc as against the level of 1960. So ferrous and non-ferrous metallurgy, oil extraction and processing, enrichment of minerals and fuels, engineering, power and chemical industry have become already, and they will become even more so in the future, decisive branches of our industry which precede the development of industry as a whole and the entire economy of the country. The priority development of heavy industry has been accompanied with high development rates of the light and food industry, with a view to fully and ever better meeting the main demands of the population for broad consumer goods. Albania has been turned into a huge working and construction site. Giant hydro-electric plants, railroads, modern industries have come into production all over the country. Our heroic working class and our gifted specialists completed with success and commissioned all those projects envisaged in the 6th Five-Year Plan which were left half-way or otherwise were sabotaged by the Chinese revisionists. To the Albanian workers and specialists goes the credit for commissioning the “Steel of the Party” metallurgical complex in Elbasan, the “Light of the Party” hydro-electric plant at Fierza, the oil deep processing factory at Ballsh, the “Enver Hoxha” automobile and tractor combine in Tirana, the PVC factory in Vlora, the coal mine at Valias, the ferro-chrome factory at Burrel, etc. The fact that the socialist economy of Albania meets all the needs of the country for our electric power and other fuels from its internal sources, that industry is supplied with local raw materials, that Albanian steel is produced and steps have already been taken for the production of tractors and trucks, ships, drilling rigs and other machinery, that progress is being made towards the expansion of production of equipment, machinery, and complete factories on the basis of self-reliance, that projects of large dimensions, such as hydro-electric plants, the expansion of the existing factories and combines, the building of new factories for the enrichment of minerals, etc have been designed and built without outside aid, is of capital importance for the present and the future. In the 1980s the production of spare parts rose to 63 per cent against 1975, ensuring about 95 per cent of the needs of the economy for spare parts. In the 1st Five-year Plan (1951-1955) our mechanical engineering industry, to quote only one example, met only 15 per cent of the needs for spare parts, and in the 2nd Five-year Plan (1956-1960) only about 40 per cent, and this for the limited quantity of machinery in use at that time, until it gradually reached the present-day level of production. The trend in Albania today is towards the construction of machinery. This is a great gain of the policy of the PLA for the socialist industrialization of the country, for the transformation of Albania into an advanced industrial-agricultural country. Likewise, the setting up of new branches and the expansion of the existing branches of the heavy processing industry will raise the local processing of the mineral and non-mineral wealth of the country to a higher level, to the production of half-finished and finished products, This will give a new boost to the local production of the means of production and of the more necessary articles for the extended socialist reproduction, for the raising of the well-being of the people and strengthening of the defence potential of the Homeland. At the same time, this will create many possibilities for Albania to come out on the world market with new industrial articles, which are in great demand and highly profitable economically. This process of development is also apparent in the fact that while in 1960 locally processed goods accounted only for 46 per cent of the volume of export, in 1980 this figure reached above 65 per cent. All this is a significant achievement of the correct policy followed by the PLA and clearly shows the further strengthening of the political and economic independence of the country, the stability of the socialist economy. Thus, the socialist industrialization of the country represents one of the greatest achievements of the people’s power in the work for socialist construction, one of the decisive conditions for the overcoming of the traditional backwardness, as well as one of the fundamental material factors for the complete construction of socialist society at present and for the future. The development along these lines has brought about that the volume of industrial production occupies first place in the total social product and in the national income. In 1980 industrial production accounted for more than 57 per cent of the social product, as against 41 per cent in 1960, and the national income realized in industry accounted for more than 42 per cent, as against 20 per cent in 1960. Following this road, industrial production has developed at a rate 3-4 times higher than the rate of the increase of population, which has led directly to the improvement of the material well-being and the raising of the cultural level of the population. Thus, the turn-over of food-stuffs in retail trade in 1980 has increased 14 fold and that of other broad consumer goods has risen about 8 times against 1950, at a time when the population of the country has more than doubled in the same period. The PLA has looked upon the development of industry as an important factor of strengthening the social base of the people’s power, because it enables the numerical growth and qualitative development of the working class – the vanguard of the revolution and socialist construction. Without a developed industry there can be no developed working class. Along with the development of industry and the other branches of the people’s economy, the working class which plays a decisive role in the whole economic and social development of the country, has grown and developed, too. Comrade Enver Hoxha says, “We have today a large working class, with a high political class consciousness, with remarkable capabilities and talents. And it is becoming more aware of its role as the class in power” (Enver Hoxha, “Reports and Speeches 1969-1970”, p. 191, Alb. ed.). In the ranks of the working class today militate more than 500,000 people as against 15,000 before Liberation. Together with their families they account for more than 34 per cent of the total population, or one third of the active urban and rural population, as against one tenth in 1950. To this must be added the important fact that the working class employed in industry represents more than one third of the total number of workers and plays a leading role in regard to the working class as a whole. The working class today has reached a much higher level from the political, ideological, cultural and professional standpoint, and as such it is increasingly giving the tone to the life of the country, shouldering a heavy burden, aware of the new and greater tasks the Party has assigned to it. The fulfilment of these tasks is closely linked with the further increase of its ranks, but especially with its own strengthening and revolutionary tempering through active participation in leading, controlling, and defending the people’s power and the country in general. In this question, the PLA is guided by the Marxist-Leninist thesis that the leading role and the historic mission of the Party and the working class do not end with the seizure of political power or with the establishment of the socialist relations of production, but this role and mission will continue to exist up to communism, which cannot be built without the rule by the working class, without the proletarian Party and state, without control from above and from below. In the conditions of socialism, the existence of the two friendly classes – the working class and the cooperativist peasantry, as well as of the stratum of the new people’s intelligentsia is connected with the existence of the social property. These two classes live in close alliance with each other, and the leading role in this alliance belongs to the working class. The moral-political unity of the Albanian people has this alliance as its basis. With the development of socialist society and with the changes that take place in its class structure, the role of the party and of the working class not only does not diminish, as the revisionists claim, but, on the contrary, it is enhanced and strengthened further. Socialism and the process of its development through the strengthening of the moral-political unity of all the broad working masses, broadens the basis of the political, ideological and economic influence of the working class on all the aspects of the life of the country, both in city and country. The process of socialist industrialization in Albania has gone through a difficult road, through a fierce class struggle against the many difficulties and obstacles raised by the enemies of socialism within the country and abroad. Hence, a persistent struggle had to be waged to expose and reject the anti-Marxist and capitalist views of the modern revisionists who have tried to impose their revisionist-capitalist line of the industrialization of the country on our Party and Government. The Yugoslav revisionists wanted the PLA to follow an economic policy which would prevent Albania from setting up and developing its national industry. According to them, Albania should limit itself to farming and the production of mineral raw materials, which would be processed by the Yugoslav industry. The PLA exposed and rejected these out-and-out imperialist and protectionist aims. The efforts of the Soviet revisionists to divert Albania from the socialist road of the true industrialization of the country are also notorious. They went about it in open and underhand ways, resorting to ail kind of “arguments” and pressure. They “suggested” that the industry of the Soviet Union could meet all the needs of the Albanian economy, so there was no sense in little Albania trying to set up an industrial system of its own. Another “argument” employed by the Khrushchevite revisionists was that of the climate, as if nature had preordained that Albania should become a “blooming fruit-garden”, but this miscarried, too. They frequently sought to prove that Albania allegedly lacked the raw materials needed for a modern industry, etc. etc. Besides, they tried in vain to prove that Albania could not find the considerable financial means necessary for setting up an industry of its own. The Party of Labour andthe Government of Albania courageously combated these views, pressure and wrecking activity of the Soviet revisionists and defeated their chauvinistic and capitalist plans. The Chinese revisionists employed the same practices when they unilaterally cut all agreements, left incomplete or sabotaged the projects they had undertaken to build and commission together with the Albanian workers, thus revealing their anti-Marxist features after they were resolutely exposed by the PLA. How hostile, anti-Marxist and reactionary have been all these stands and actions of our enemies, and how correct, far-sighted and Marxist-Leninist has been and remains the general line of our Party, how self-denying has been the work of the Albanian people for the construction of socialism, and in particular for the socialist industrialization of the country – this clearly emerges from the brilliant balance of great successes and victories with which our people are coming to the 40th anniversary of the founding of our glorious Party and its 8th Congress, which will be convened in Tirana on November 1st this year. Albania boasts today a developed many-branched industry. 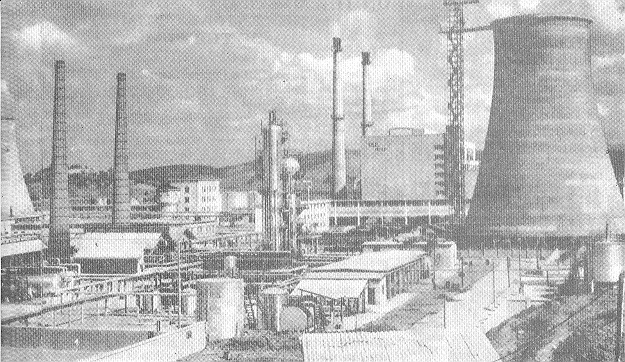 View of the "Gog Nushi" plant in Fier.